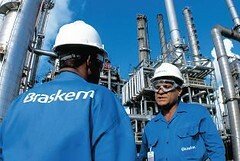 Citing the European slowdown, Brazilian chemicals firm Braskem is delaying the construction of its two new ethanol-based plants in Brazil and a naphtha-based PP plant until 2013 and will instead maximise production capacity in existing plants and modernise its current petrochemical park. Industry analysts polled by ValorEconomico speculate that Braskem bases much of its resin production on naphtha in Brazil, and not cheaper natural gas, and this has dragged down the company’s performance. The company is making huge investments with state-controlled oil company Petroleo Brasileiro (Petrobas) in the new petrochemical complex in Rio de Janeiro, called Comperj. Budgeted at US$13 billion, Comperj will produce natural gas (70%) and naphtha (30%) with two refineries managed by Petrobras and a petrochemical complex where Braskem is majority partner with US$4 billion invested.